The advent of the digital age has had more than a telling impact on the world of electronic music production and performance. Countless software plugins, DJ platforms and DAWs have undoubtedly simplified the process of playing and making music but at a cost. To digitally recreate the warmth, quality and clarity that music which is made and played on analogue machines is not simple task. The tonal individuality and output of modular music is more often than not unrivaled. Enter Monophonik – A fearless India artist who is currently pushing the boundaries of sonic possibilities which his mostly hardware enabled performances and productions. Theres a lot of things about synthesizers that attract me towards them. Couldn’t point out one single factor that made me realize how powerful these tools are. Its honestly a matter of using them over a period of time and getting familiar with them to a point where you actually fall in love. Wouldn’t call it love at first sight! The absolute unpredictability of the instruments is also something that intrigues him as he has been using hardware ever since he started making music. While in college, Shatrunjai burnt the midnight oil by working part time jobs which helped him save enough money to buy his first digital synth – The Access Virus TI. From then on there was no looking back as he always preferred to use machines and the workflow that comes with it to create his music as an artist. My first album that I released as an independent musician was made almost entirely on hardware and modular synths, so when I got my first gig, I thought the best way to probably play out my music would be with the help of the same tools that were used to create the music! Playing and performing completely on hardware is more than intimidating. There is minimum use of a laptops, no sync buttons and absolutely nothing from stopping a complete train-wreck of the set apart from the artist himself. Monophonik’s live set literally revolves around the concept of a ‘one man band’ , in his own words. To get a little more technical, MIDI is being sent out of Ableton to these synths and I keep changing the parameters in my patch to get different tonalities and timbres of sound from a heavy baseline to a top line. Carrying an entire performance rig to gigs in any city is always a difficult task. Extra attention and thought needs to be put into the role of each instrument as the sound that is generally heard on smaller system now has to be recreated in a different space on a much bigger system. Having the right combination of synthesizers, FX units, sequencers and other devices directly affect the nature of the performance. Monophonik currently uses a standard prefabricated Doepfer BS2-P9 Eurorack coupled with modules from mutable instruments and make-noise. The sound is characteristically raw and purposely left a bit unpolished to give that glorious warmth that is so often missing from near perfect digitally mastered music. Of course, minimal compression and limiting is necessary but his sonic palette is still allowed to breathe unabated. He now considers this setup to be a test flight for his more expansive ambitions as he plans to have more-compact and varied rig with modules from manufacturers across the board in the near future. So which module/synthesizer would be the one of his dreams ? Wow, thats a tough one. If I really had to pick one it would probably be the Oberheim 8 voice SEM, only because that’s one unique vintage synth that no one has really been able to emulate or match up to. 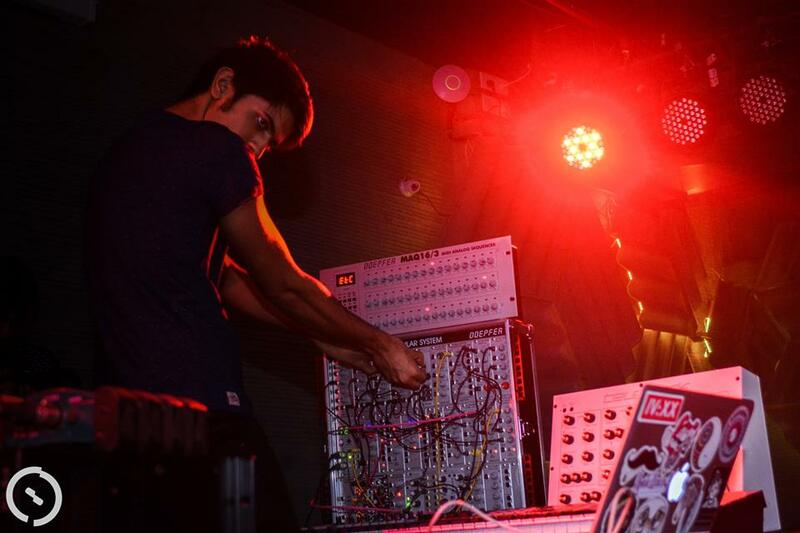 That being said there are a few nascent Indian companies that have been manufacturing modular synthesizers and FX units that Shatrunjai thinks does bode well for the future. For one, it will certainly help upcoming Indian producers get their mittens on to affordable, reliable and competitively priced gear instead of breaking the gap to expensively import the same from stores abroad. Brands such as Animal Factory Amplification and Modular Analog are currently making a name for themselves and are putting Indian on the map at the same time.